Increased extracellular matrix (ECM) collagen is a characteristic of muscle insulin resistance. Matrix metalloproteinase (MMP) 9 is a primary enzyme that degrades collagen IV (ColIV). As a component of the basement membrane, ColIV plays a key role in ECM remodelling. We tested the hypotheses that genetic deletion of MMP9 in mice increases muscle ColIV, induces insulin resistance in lean mice and worsens diet-induced muscle insulin resistance. Wild-type (Mmp9 +/+) and Mmp9-null (Mmp9 −/−) mice were chow or high-fat (HF) fed for 16 weeks. Insulin action was measured by the hyperinsulinaemic–euglycaemic clamp in conscious weight-matched surgically catheterised mice. Mmp9 −/− and HF feeding independently increased muscle ColIV. ColIV in HF-fed Mmp9 −/− mice was further increased. Mmp9 −/− did not affect fasting insulin or glucose in chow- or HF-fed mice. 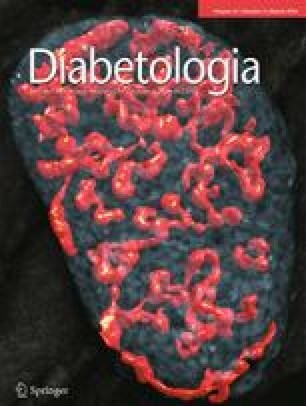 The glucose infusion rate (GIR), endogenous glucose appearance (EndoRa) and glucose disappearance (Rd) rates, and a muscle glucose metabolic index (Rg), were the same in chow-fed Mmp9 +/+ and Mmp9 −/− mice. In contrast, HF-fed Mmp9 −/− mice had decreased GIR, insulin-stimulated increase in Rd and muscle Rg. Insulin-stimulated suppression of EndoRa, however, remained the same in HF-fed Mmp9 −/− and Mmp9 +/+ mice. Decreased muscle Rg in HF-fed Mmp9 −/− was associated with decreased muscle capillaries. Despite increased muscle ColIV, genetic deletion of MMP9 does not induce insulin resistance in lean mice. In contrast, this deletion results in a more profound state of insulin resistance, specifically in the skeletal muscle of HF-fed mice. These results highlight the importance of ECM remodelling in determining muscle insulin resistance in the presence of HF diet. The online version of this article (doi: 10.1007/s00125-013-3128-1) contains peer-reviewed but unedited supplementary material, which is available to authorised users. We would like to thank the Vanderbilt Translational Pathology Shared Resource for performing the immunohistochemical staining of ColIV, CD31 and vWF. Part of the data from this study has been orally presented at the American Diabetes Association 72nd Scientific Sessions in 2012 and an abstract was published in ‘Orals’, Diabetes, 2012. This work was supported by National Institutes of Health Grants DK054902 (DHW) and DK059637 (Mouse Metabolic Phenotyping Center; DHW). We would also like to thank the Vanderbilt Diabetes Research and Training Center (DK020593). LK, was responsible for the experimental design and researched data, contributed to the discussion and wrote the manuscript. WHM, FDJ and DPB researched data and reviewed the manuscript. DHW was responsible for the experimental design, and reviewed data, contributed to the discussion and reviewed/edited the manuscript. All authors approved the final version of this manuscript.